The changing candidacies in the New Jersey Senate race have given voters there an election most find interesting, and with less than two weeks to go, the replacement, former Democratic Senator Frank Lautenberg, leads Republican Douglas Forrester by a 12-point margin among New Jersey's likely voters, 48 percent to 36 percent, according to a CBS News/New York Times poll released Friday. Among likely voters who have not yet made up their minds who to vote for, over half identify themselves as Independents. These voters also tend to be less educated and older. 37 percent said they would have voted for Torricelli if he had remained in the race, 34 percent would have voted for Forrester, and a quarter weren't sure. When undecided voters are pressed to make a choice between the current candidates, Lautenberg's lead over Forrester grows to thirteen points, 52 percent to 39 percent. The Democrats' replacement of Senator Robert Torricelli by Lautenberg earlier this month has not discouraged turnout – in fact, it may have rallied a few more partisans of each party to go to the polls on November 5th. 83 percent of registered voters said the switch from Torricelli to Lautenberg has made no difference in their decision whether or not to vote in November. 13 percent said it made them more likely to vote. Only 3 percent said it had made them less likely to vote. The effect has been about the same for both Republicans and Democrats. It has had an effect on the likely outcome of the race. 42 percent of likely voters say in an election between Torricelli and Forrester they would have voted for Forrester and 37 percent say they would have voted for Torricelli. Lautenberg gets much of his current lead over Forrester from two important New Jersey demographic groups -- women and independents. There is a large gender gap; women likely voters give Lautenberg a nineteen-point lead, while men are more closely divided (44 percent support Lautenberg, and 40 percent support Forrester). Republicans and Democrats support their party's candidate, but Independents (who comprise 33 percent of New Jersey likely voters) give Lautenberg the edge over Forrester, by 44 percent to 32 percent. Had Torricelli remained in the race, he might not have had Lautenberg's edge with women. He would have had only a four-point lead among women (39 percent to 35 percent), compared with Lautenberg's nineteen-point lead. Most registered voters approve of Robert Torricelli's decision to withdraw: 62 percent say the Senator did the right thing by withdrawing, while 32 percent say he should have stayed in the contest. Most are not bothered by that Supreme Court decision. 59 percent said the ruling did not bother them at all; 21 percent said it bothered them a lot, and 11 percent said it bothered them some. But New Jersey's voters are more evenly divided over whether or not it was fair that the Democratic party could replace Torricelli on the ballot. 52 percent say the replacement was fair, 42 percent say it was not. Roughly the same percent say the New Jersey Supreme Court made the right decision in allowing that replacement to go forward. Partisanship plays a role in responses to these questions. Among registered voters, 33 percent of Republicans said the replacement was fair, while 70 percent of Democrats said it was. Torricelli does not enjoy high job approval or favorability ratings. Only 32 percent of registered voters approve of the way Robert Torricelli is handling his job as Senator, and 45 percent disapprove. This is a substantial change from one year ago, when Torricelli's job approval stood at 59 percent. And a majority of New Jersey's registered voters currently hold a negative opinion of Torricelli. 57 percent have an unfavorable opinion of him, and only 11 percent have a favorable opinion. The current pairing won't be a cliffhanger in the minds of most voters; 56 percent of registered voters expect Lautenberg will win the election. But at the very least, the replacement seems to have made things more exciting for New Jersey's registered voters: 65 percent, an especially high number in contemporary campaigns, say the Senatorial race has been interesting, not dull. In comparison, only 35 percent of registered voters said the 2000 New Jersey Senate race, which Jon Corzine won, was interesting. More than eight in ten likely voters say they are paying a lot or some attention to the current campaign. New Jersey registered voters generally view both candidates for U.S. Senate favorably; however, many are unable to form an opinion about either candidate. 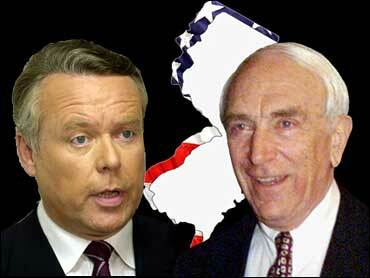 More than twice as many New Jersey voters have a favorable as opposed to an unfavorable view of Frank Lautenberg. But despite his three terms in the U.S. Senate, 32 percent of registered voters do not have an opinion of him. Douglas Forrester is even less familiar to voters than Lautenberg. While more voters have a favorable opinion than an unfavorable opinion of him, half offer no opinion of him at all. Torricelli's withdrawal removed one of Forrester's campaign themes – that his opponent was unethical. Now, both candidates get good marks on honesty and integrity. A third of New Jersey voters say Lautenberg has more honesty and integrity than most people in public life, while nearly a quarter say the same about Forrester. However, since Forrester appears to be an unknown quantity to many voters, half were unable to rate him on this characteristic. Less than one in ten voters think either Lautenberg or Forrester have less honesty and integrity than most people in public life. Most New Jersey voters also reject the claim that at 78, Lautenberg may be too old to serve effectively. 72 percent of New Jersey voters are not worried that Lautenberg is too old to be an effective Senator, while just a quarter are worried he is. Even most Republicans reject the notion that Lautenberg's age is a concern. Though most New Jersey voters say it is more important that a U.S. Senator be someone with a fresh approach to the country's problems than someone with experience in the Senate, Lautenberg's experience as a U.S. Senator is seen by many voters as a plus when it comes to getting things done in Washington. Forty-seven percent say Lautenberg's past experience will make him more likely to get things done in the Senate, while 42 percent say his experience won't make much of a difference. In addition, 58 percent of New Jersey voters approve of the way Lautenberg handled his job as U.S. Senator before he retired in 2000. Douglas Forrester's experience as a business executive does not appear to carry as much weight. 57 percent of voters say his business experience will not make a difference when it comes to getting things done in Washington, while one in five say his past experience will make him more likely to get things done. Lautenberg and Forrester voters describe their support differently. While a majority of Lautenberg voters have positive feelings about their candidate, Forrester voters are more lackluster -- nearly half express some doubts about him. Among likely voters, 59 percent of Lautenberg supporters say they are enthusiastic about their candidate, compared to 47 percent of Forrester voters. 33 percent of those who say they will vote for Forrester have reservations about him, and another 14 percent say theirs is a vote against his Democratic opponent. Registered voters see the candidates as ideologically different. 41 percent of voters describe Frank Lautenberg as a liberal, 34 percent say he is moderate and 9 percent think he is conservative. With regard to Forrester, perceptions are almost reversed. 41 percent think Forrester is a conservative, 24 percent say he is moderate, while just 7 percent say he is liberal. In New Jersey, the economy, taxes and other domestic issues are the top priorities for voters in this year's Senate campaign. 16 percent of registered voters name the economy and jobs as the single most important issue in deciding their Senate vote in November. Taxes are the second most often cited. And, voters are nearly five times as likely to vote for a Senate candidate because of his positions on the economy, as opposed to his positions on Iraq. Concern for the economy tops the list of the most important issue in their Senate vote for Democrats and Independents. For Republicans, the top issue is taxes. And perhaps reflecting the charges and investigations leading to Torricelli's dropout, issues of ethics in government and politicians are also high on voters' priority lists. Republicans care more about the latter than Democrats do. Other issues that have been the focus of this year's campaign, such as abortion and the death penalty, receive much lower priority. Almost seven in ten voters say they are more likely to vote for a Senate candidate because of his positions on the economy, and not his positions on Iraq. This relatively low emphasis on the Iraq issue may mean Forrester's attack on Lautenberg for voting against the Persian Gulf War Resolution in 1991 won't matter very much in this Senate campaign. With the possible retirement of some Supreme Court Justices looming, and the party control of the Senate in the balance, nominations to the Supreme Court have become an important issue in the Senate races this year. New Jersey voters think both Senate candidates are more likely than not to make decisions they agree with about Supreme Court nominees, but Lautenberg has an edge on this issue. Fifty-one percent say Lautenberg would make decisions about Supreme Court nominees that they would agree with, while 26 percent say he would not. Voters are split when it comes to Forrester and Supreme Court nominees. 38 percent think Forrester would make decisions they would agree with, and 32 percent say he would not. Although the Democratic candidate has changed, Forrester, whose main campaign strategy before early October was attacking Torricelli, is still seen as continuing a strategy of attack against Lautenberg. By 47 percent to 35 percent, New Jersey voters say Forrester has spent more time attacking Lautenberg than explaining what he would do as Senator. In contrast, voters narrowly say Lautenberg has spent more time explaining his plans than attacking his opponent. Fewer than half, however, think either candidate has attacked the other unfairly. One in five say both have done so, while more than a third say both candidates have been fair. Forrester is twice as likely as Lautenberg to be viewed as the sole candidate to have launched unfair attacks on the opponent. Roughly six in ten registered voters have seen each candidate's campaign ads. So far, those ads seem to have had similarly mixed effects. Voters who have seen or heard each candidate's ads are just as likely to have changed their minds for the better as for the worse about the other candidate. Four in ten voters say the ads haven't changed their views about the other candidate at all. These ads have been more helpful in improving each candidate's own image – though perhaps not to the extent each campaign might have liked. Seven in ten voters who have seen or heard Forrester's campaign commercials say their views of Forrester changed as a result – 39 percent for the better, but 29 percent for the worse. Lautenberg's ads have affected fewer people -- 46 percent of voters who have been exposed to Lautenberg's ads say their opinion of the former Senator remains the same. But 31 percent say they think better of Lautenberg after seeing his campaign commercials, while just 14 percent say they think worse of him. Ethics problems had a particular impact on Senator Torricelli, but most of New Jersey's registered voters believe those kinds of problems are commonplace in their state. 55 percent think that corruption is widespread in New Jersey politics, while 38 percent believe corruption is limited to a few isolated incidents. The Democratic party fares slightly worse than the Republican party when it comes to perceptions of corruption. 25 percent of registered voters say the Democrats have more corrupt politicians; 15 percent say the Republicans do. But 31 percent point the finger at both parties equally. But all the candidates – and even Torricelli - can at least take heart that they're doing better than the Boss himself, at least when it comes to elections. Earlier this year, there were suggestions that Jersey native son Bruce Springsteen step into the race for Senate. Asked if they would have voted for Bruce Springsteen had he run for Senate this year, only 13 percent say they would. However, among registered voters under 30, the Boss would have received 30 percent of the vote. This poll was conducted among a statewide random sample of 994 adults (including 772 registered voters) in New Jersey, interviewed by telephone October 19-24, 2002 The error due to sampling could be plus or minus four percentage points for results based on registered voters. Sampling error for subgroups is higher.